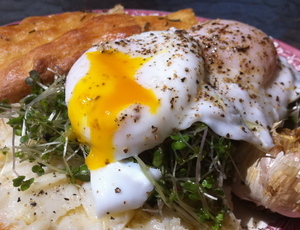 The deep orange of the yolk happens when our chickens eat greens from the garden. A year ago this month, there was a national egg recall. You would think more communities would be welcoming the chicken to backyards as a result. Unfortunately, that does not seem to be the case – many cities are still mired in debates similar to what happened in Grand Rapids, MI last August. The egg recall of 2010 started slowly. On Aug. 13 2010, Wright County Egg Farm of Galt, Iowa, issued a voluntary recall of eggs due to reports of sickness from salmonella poisoning. According to the egg reporting of Juliana Keeping, the national egg recall was expanded to Michigan on Aug. 25, 2010. 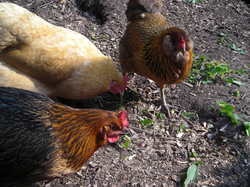 On Aug. 10 2010, Grand Rapids City Commission voted down an ordinance for residents to be able to keep backyard chickens. Several Grand Rapids commissioners argued they needed more information before they could approve the measure. In 2008, when Ann Arbor passed the city chicken ordinance, there were similar points argued around noise, waste pollution and avian flu. As my lawyer friends point out, those three points could be used against my dog and cat (just ask a pregnant woman about cleaning out a litter box). However, my dog and cat don’t provide food for the family every day – unlike my chickens. Though just 3 years since the Ann Arbor debate the backyard chicken conversation already feels antediluvian. In the last year, I had hoped the egg recall would have shortened, nay, rendered meaningless, the backyard chicken debate for our neighboring cities. Unfortunately, I continue to hear of communities fighting for backyard chickens, losing the right to grow their own food in the face of outdated zoning rules. Our girls eating weeds from the vegetable garden. The urban explosion of the 1920s fueled zoning rules (NYC adopted the first zoning rules in 1916). People left the country and did not want to live next to a slaughterhouse pouring offal into the streets or the noise of a machine shop. Residential zoning rules were adopted to protect home-owners from commerce and animal husbandry. 90 years later, you would think a modicum of compromise and common sense might prevail in our zoning rules – especially in the light of food recalls. This entry was posted in On the Farm and tagged Backyard chickens, Corinna Borden, egg recall, eggs, Real Time Farms. Bookmark the permalink.